1 Can I set a stopover station in the search result screen? Open the content area. 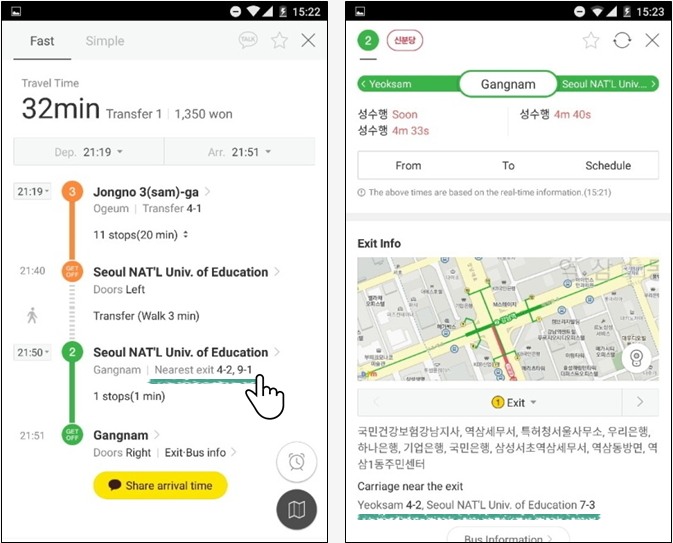 If you don't like the quickest and simplest routes shown by KakaoMetro, you can set a stopover station by clicking "Add Stopover" at the top of the result screen. - Add Stopover : You can add a stopover station by searching a station name or selecting one from the map. 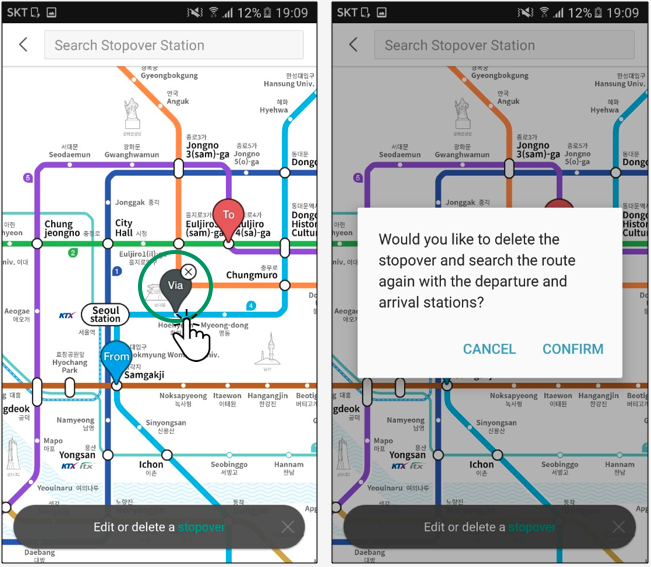 - Change Stopover : You can change the existing stopover station by searching a station name or selecting one from the map. - Delete Stopover : Click "Via" and delete the stopover station. You can search the route without a stopover. 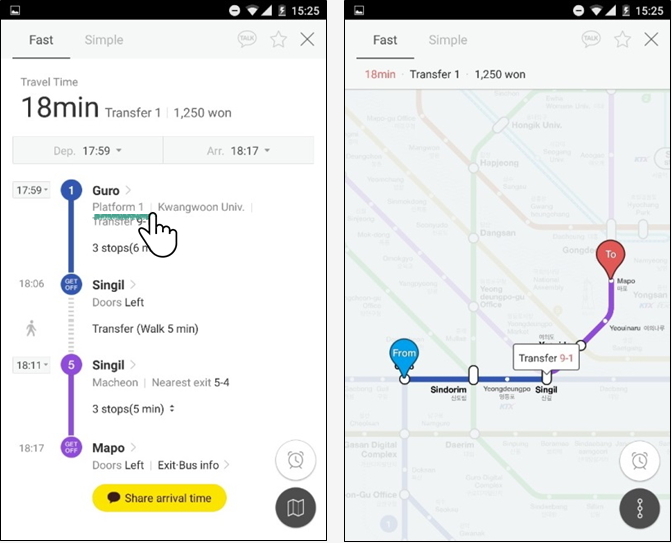 2 Can I still use the Favorites from Subway Navigation app on Kakao Metro? Open the content area. 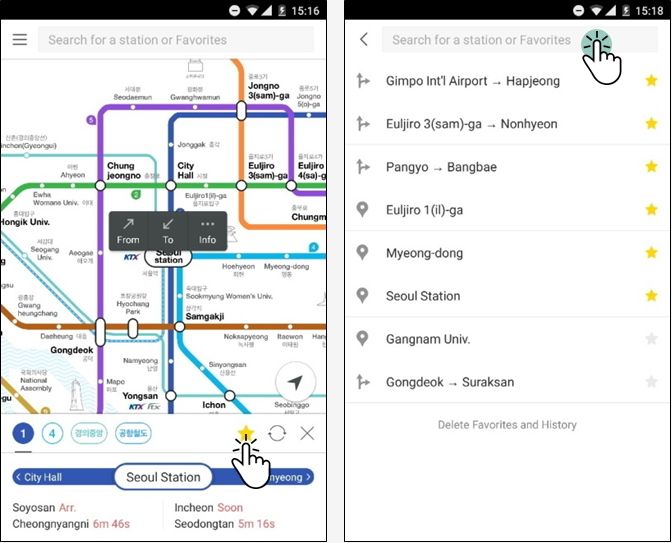 When you upgrade from Subway Navigation to Kakao Metro, you can retreive the existing Favorites list. 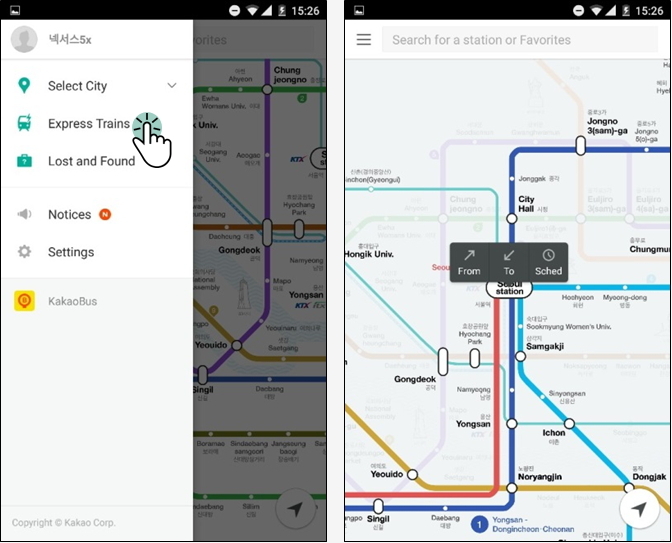 It will be automatically copied during the first app update. 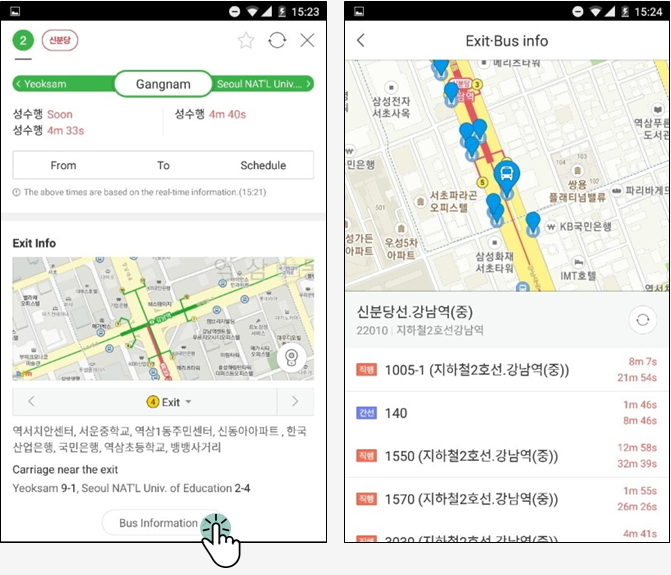 3 Can I use Kakao Metro offline? Open the content area. 4 Convenient and helpful tips available only at Kakao Metro!! 01.Carriage near the exit Open the content area. 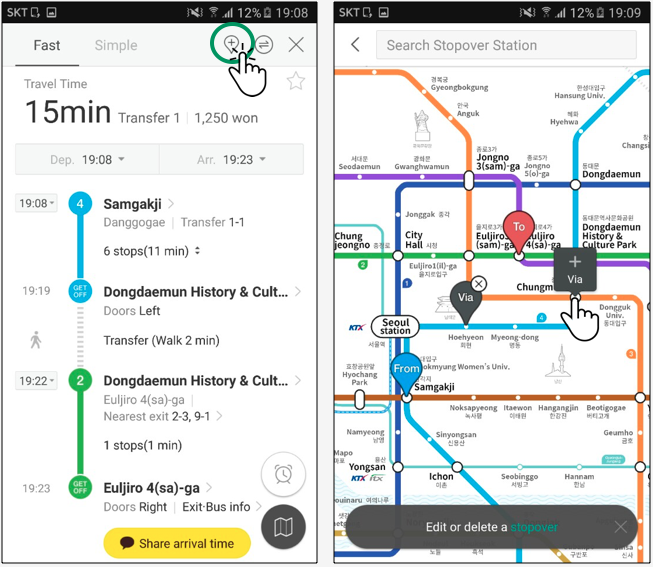 5 Convenient and helpful tips available only at Kakao Metro!! 02.Bus information by exit Open the content area. 6 Convenient and helpful tips available only at Kakao Metro!! 03.Platform Information Open the content area. 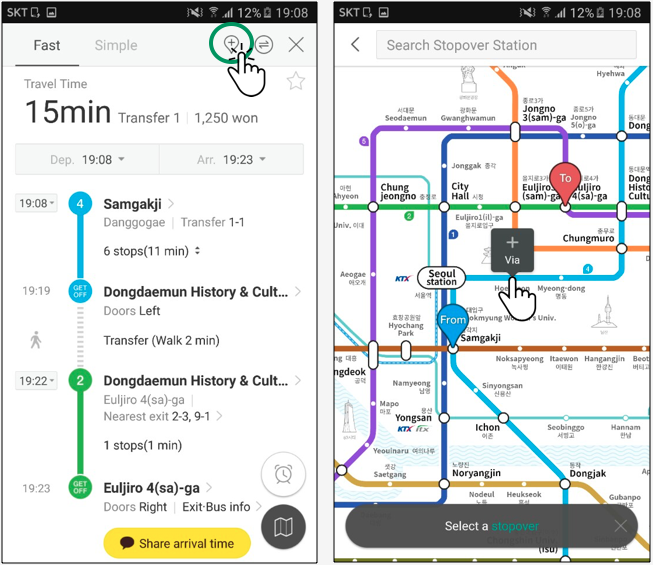 7 Convenient and helpful tips available only at Kakao Metro!! 04.Express Trains Open the content area. 8 Do I have to log in to use Kakao Metro? Open the content area. 9 How is the transfer time measured? Open the content area. 10 How many items can I add to Favorites/History? Open the content area.